Overall Dimensions: 18"D x 23 3/4"W x 49"H. Seat height 29 3/4". 40 - 44 Lbs. 1 5/16" O.D. all MIG welded arched support legs. Thermoplastic coated seats with powder coated frame. Five styles to choose from. 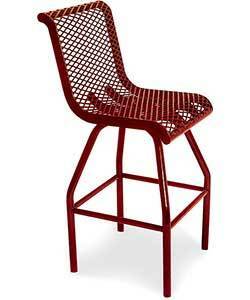 Imagine sitting at an outdoor bar in this Tall Food Court Chair. With a wide variety of styles to choose from, you can create a distinctive look to your outdoor venue! With its thermoplastic seats and powder coated frames, it will stand up to any commercial application easily and last for many years to come! Available in a variety of vibrant colors! Call or email National Outdoor Furniture today for a quick quote!